Maryland became a state April 28, 1788, the 7th state admitted to the Union. Name Origin: Named for Princess Anne (1665-1714) who became Queen of England in 1702. 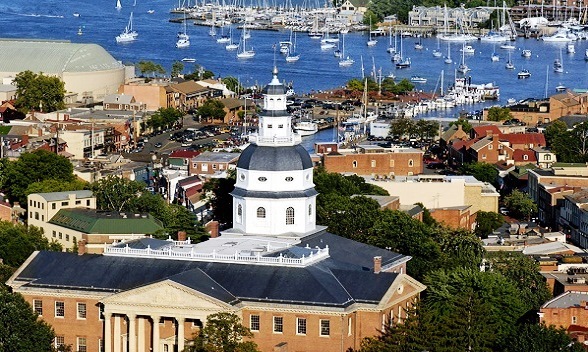 Annapolis was laid out as the provincial capital in 1695. Originally named Anne Arundel’s Towne for Anne Arundel (1615-1649), wife of Lord Baltimore, Maryland’s founding sponsor, it was renamed Annapolis in 1694 for Princess Anne (1665-1714), daughter of James II, who reigned as Queen of England from 1702 to 1714. The State House was begun in 1772 and is the oldest in continuous legialative use in the United States. It was the first peacetime capitol of the United States – the Treaty of Paris was ratified here January 14, 1784 by the Congress of the Confederation, formally ending the American Revolution. In December 1783, meeting in the Senate Chamber, General George Washington had returned to the Congressional delegates the signed commission he received at the beginning of the conflict, thereby acknowledging civilian power over military. Annapolis today is a graceful colonial town, with life centering on water activities, government, and the US Naval Academy. St John’s College (1784) is located here too – Francis Scott Key was an alumnus. The entire downtown area is a designated National Historic District, with houses painted in the brilliant blues, reds, and sea-green colors of long ago. The paint; the authentic colonial blues and reds; the houses, each one spaced against the next; the narrow circling brick-paved streets; the wood-domed capitol (no nails, just pegs); Maryland crab and Old Bay seasoning and Ego Alley in the harbor for showing off your boat; the United States Naval Academy. Mountains near: Allegheny, Catoctins, Appalachians. Hoye-Crest, located in the western tip of the state along Backbone Mountain, is the highest point in Maryland at 3,360 feet.